Clique up! The NBA playoffs are back and LeBron James has traveled through time, back to high school. These are two exciting occurrences that may or may not be linked together. 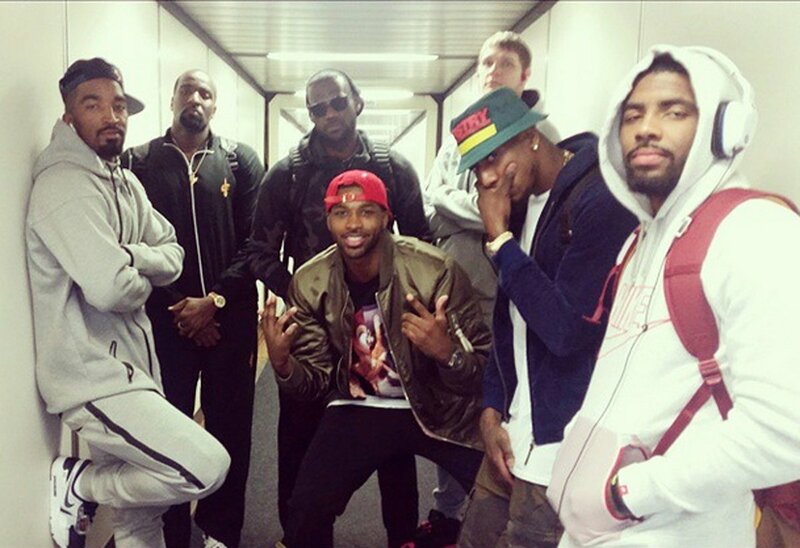 God, I love Kendrick Perkins on that photo, standing in the back, looking 30 years older than everyone else. He’s just there to drive the kids home after practice. Anyway, the Eastern Conference looks like an AAU ball game this year again, compared to World War 3 going on in the West. LeBron and his posse should more or less strut their way to the NBA finals barring any unforeseen injury disaster. My apologies to the cities of Atlanta and Chicago, but it’s true. Nonetheless, it’s always interesting to map out how it’s going to turn out, because you never really know. Predictions are meant to make you look like a genius or make you look utterly stupid. There’s no in-between. I love doing them nonetheless because I love arguing my point to death before the fact can prove me wrong and ruin my day. Thank God I’m not a betting man! Let’s see what we’re dealing with in the Eastern Conference. This was unexpected. The Brooklyn Nets are a fiasco, their franchise is moribund and will remain moribund for the foreseeable future, and their coach doesn’t even seem interested in being in the playoffs. Testimonies of how dysfunctional the Nets are have been pouring in all week long. The Atlanta Hawks have showed vulnerability over the last month, have struggled with injuries, but they have solid motion offense based on the catch-22 pick-and-roll ran by Jeff Teague, Al Horford and their distant cousin Kyle Korver and they’re facing one of slowest, clumsiest defende in the league. That’s the thing with the Hawks: everybody can score and everybody can shoot the three. They should have no trouble breezing through Brooklyn from sheer offensive crushing. Expect Atlanta to keep the ball moving and rain down threes from everywhere like divine fire from the sky and beat the Nets into submission way before the series is over. Prediction: Hawks in 4. Brooklyn is hopeless. They feel hopeless and out of place. Losing the first two in Atlanta is going to be the death blow. This is an already more stimulating series than Atlanta Vs Brooklyn, thanks to the man Bill Simmons aptly named President-Elect Brad Stevens. Boston’s young a brilliant coach is the only advantage they have over Cleveland. The Celtics will have their moments in this series, but it’s not going to translate in a lot of wins. Cleveland has two of the best slashers in the business in LeBron James and Kyrie Irving, and they’re going to feast on the likes of Jared Sullinger, Tyler Zeller and Kelly Olynyk under the basket. Both will have multiple 40 points game in this series and will the Cavs to wins by themselves. If Avery Bradley can disrupt J.R Smith‘s game from the perimeter, maybe they can tip the precarious balance the Cavaliers are build on (anything build on J.R Smith is precarious), but I doubt I’ll be enough with the Celtics’ glaring hole in the lane. It’ll be a remake the series where the Miami Heat beat the Chicago Bulls, two years ago with Isiah Thomas starring as Nate Robinson. Prediction: Cavaliers in 5. The Celtics will take a game. It might be game one (it would crash the internet for 48 hours), but don’t get your hopes up. It’ll only break your heart. I want to believe in the Bulls. They are a fun team. They have fun, spirited players and the pieces of their roster are increasingly more cohesive. The Bulls just can’t seem to pull it together, though. Rooting for them feels like rummaging through the Tupperware drawer, trying to find the matching lid to go on your lunch. What we got here are two defense-oriented teams who can’t seem to will a basket in to save their lives. I love the Bulls and I want them to do good in the playoffs, but they’re going to struggle like hell against a younger, lenghtier and more energetic team. I think the key in this series is to give the ball to Pau Gasol and let him work his magic in the post against the likes of John Henson and Ersan Ilyasova, but it’s going to be a struggle every step of the way. I ultimately think Chicago has more pieces right now, but don’t count Milwaukee out. This should be the best series in the East, at least in the first round if you can stomach games that finish 82-75 or 80-68. Prediction: Bulls in 7. They’re going to rip the last game away through veteran leadership, but I could be wrong. This could really go either way. I have strong opinions about that series and I’m sure few people share them: I think that when everybody is healthy and motivated, the Wizards are a way better team than the Raptors. They have one of the best backcourt in the league in John Wall and Bradley Beal and the pieces they surrounded them make a lot of sense. Only problem is that they’re like a Ferrari being driven by Gob Bluth right now. They’re going nowhere fast. Kyle Lowry doesn’t have the luxury of playing moribund Deron Williams right now. He’s playing one of the quickest, most electrifying players in the NBA, who’s got just about every physical advantage on him in John Wall. If Nene and Marcin Gortat have a good series down low (which I think they will, Toronto’s front court is their weak point), this series is going to get out of hand fast and Randy “Gob Bluth” Wittman might just save his job for another year. Nobody wants that and it doesn’t mean the Wizards have any chance of making a deep run, but Wittman might survive another rainy season with another playoff series win. Prediction: Washington in 5, and a long, introspective summer in Toronto.